2015 marks the 50th anniversary of the death of Sir Winston Churchill KG. As customary on the death of a Knight of the Garter, Churchill’s Garter achievements (banner crest, helm and sword) were removed from his Garter stall in St George’s Chapel on the announcement of his death and a wreath was placed in his stall, as shown in this photograph taken in 1965 [SGC PH CER.34]. 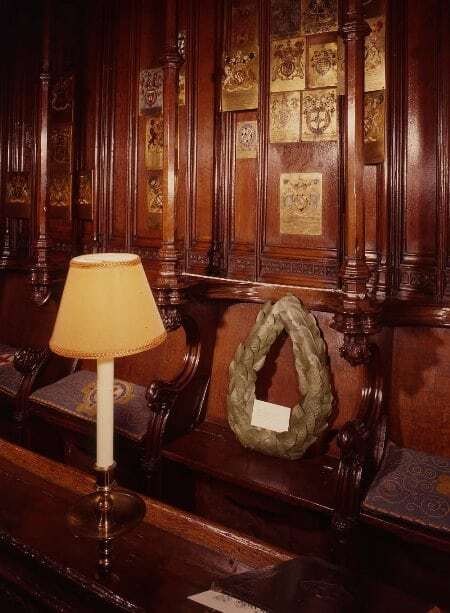 The wreath remained in the stall until the presentation of Churchill’s banner to his family at Evensong on 5 April 1965. Churchill’s Garter stall plate remains on the stall as a permanent memorial of his membership of the Order of the Garter. However, it was not the only stall plate made for Churchill’s stall – the other one is now believed to be in private hands. How did this come about? Sir Winston Churchill was nominated as a Knight of the Garter on 24 April 1953 and invested and installed over a year later, on 14 June 1954. However, the production and fixing of his stall plate were delayed by a long running dispute between the stall plate maker, Harold Soper, and the College of Arms. Soper produced a partially completed stall plate for Churchill’s installation ceremony in 1954, but removed it immediately after the ceremony ‘in its unfinished state’, replacing it with a cardboard dummy plate of Churchill’s quarterly arms and two crests. By 5 October 1954, Soper informed the Garter King of Arms, Sir George Bellew, that the stall plate was finished but refused to produce it or to submit an invoice. On 29 November, Bellew wrote to Soper: ‘Can you let me have the Churchill Plate? If you do not wish me to have it and refuse to send it you can scarcely blame me for having another one made elsewhere, but that seems to me a foolish waste’. The manufacturer chosen was engraver George T. Friend. However, Friend lacked the skills and experience of Harold Soper in working with enamel and therefore came up with an inferior product. When Friend sent Churchill’s plate to the College of Arms for approval, the Garter King of Arms commented that he was disappointed that the red used on the plate was not brighter and noted that some of the enamel in the engraved surround had already fallen out. Friend was apologetic, explaining in a letter written on 29 May 1957 that ‘the engraved lines will not hold enamel, it is a lottery chance, and each time it was fired the other colours suffered.’ Friend concluded, ‘I cannot do Churchill in time [presumably for the Garter service on 17 June 1957], all will have to come out, it means doing it again. I would rather be in disgrace for delay than bad work’. He eventually completed the plate and sent it to Garter on 14 January 1958 and in due course it was fixed to Churchill’s stall in St George’s Chapel. 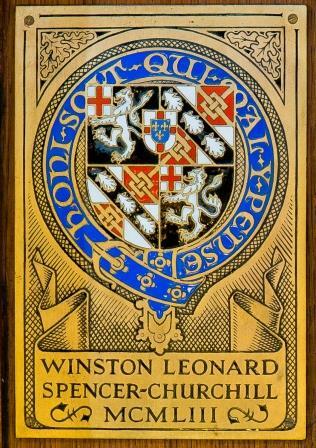 Friend went on to manufacture other stall plates for St George’s until his death in 1969 Field’s stall plate for Sir Winston Churchill What happened to the stall plate made for Churchill by Harold Soper? The plate was rediscovered in the effects of Miss Viola Soper at her death in 1989 and was auctioned with her other possessions. It fetched £6,000. In 1992 it reappeared at a Sotheby’s auction in Geneva, but did not reach its reserve price and was withdrawn from sale. It was put up for auction again in 2011 by Bonhams at an estimated price of between £10,000 and £12,000 and is, presumably, now in private hands. 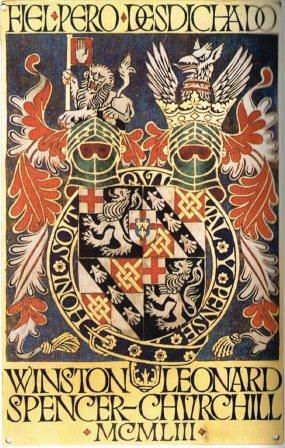 A photograph of Soper’s stall plate for Churchill which is included in P Begent and H Chesshyre, The Most Noble Order of the Garter: 650 Years (London, 1999) page 292 demonstrates the superiority of Soper’s work in design and execution. What a pity that it does not adorn the Quire of St George’s Chapel for which it was commissioned.